This week one of the most exciting grassroots political campaigns launched their own branded broadband channel. 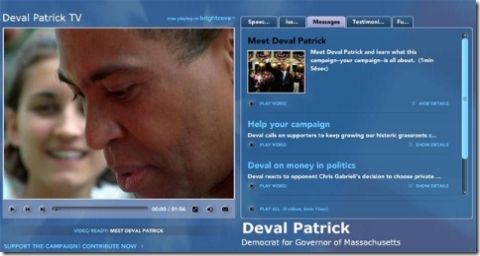 Deval Patrick, candidate for Governor of Massachusetts, has launched Deval Patrick TV, which can found at DevalPatrick.tv. A library of videos by the candidate on core issues, such as the economy, education and the arts. Testimonials from other major volunteers, candidates and others. It's by far one of the richest and easiest ways for a citizen to get educated on a candidate, and the use of video goes well beyond the political advertising of the past. Congrats and good luck Deval! (p.s. I created this post with Microsoft's new Live Writer, a FANTASTIC and free blog author product created by my brother J.J. Allaire).